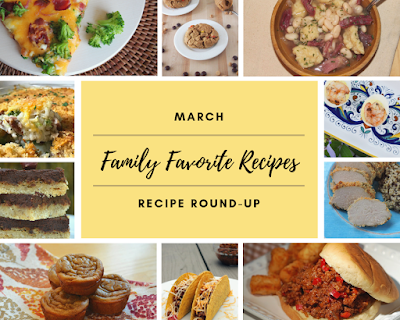 Family Favorite Recipes Round Up! In my younger days, I thought I'd like to visit New Orleans during Mardi Gras. Now that I'm firmly in my adult years, I think that while I'd still like to visit, my goals would be centered much more around food than partying. Last year we got in the spirit with some beignets. This year I couldn't decide between a flavorful main dish or a decadent breakfast recipe, so I'll be sharing one today and one on Fat Tuesday. But the indecision didn't stop there. Taste of Home had two wonderful Cajun inspired chicken pasta dishes. I printed them both out, and decided to take bits and pieces from each. It was too cold to grill, so I sauteed the chicken in a skillet. I used onions, peppers, mushrooms and garlic. I omitted the canned tomatoes from one recipe in favor of fresh from the other. I used angel hair instead of penne, it's just my personal preference. To keep it on the lighter side, I used half and half instead of heavy cream. When life hands you bananas, make muffins! Okay, that's not quite how the saying goes, but that's the case when it comes to my house. No matter how many bananas I buy, the guys will always leave 2 to 3 of them on the counter until I have no choice but to freeze them or to bake something with them. I've got quite a stockpile of recipes, but these Caramel Banana Muffins from Katherine M. have been at the top of the list to try. I added 1/2 teaspoon of cinnamon to batter. The original recipe called for baking in jumbo tins, yielding 6 muffins, which I don't own. I baked them in regular muffin tins, they took about 23 minutes, and I got a dozen. For the icing, I used heavy cream instead of 2% milk, I had a smidge that I wanted to finish off. It comes together very easily, but I did have a hard time finding a balance between cool enough to handle to pipe and not having the icing crack and break. Next time I would just spread it on top. Two years ago, I couldn't start my day without coffee. Large iced, cream, sugar, caramel syrup. I changed my way of eating, and that had to go. I made it about 4 months, but I realized that wasn't sustainable long term, so I went looking for ways to work it back in. This Honey Coffee recipe from the Taste of Home Kitchen is one of my favorites so far. I used almond milk instead of regular milk, it works better with my plan right now. I used locally harvested honey, and freshly grated nutmeg and cinnamon. This will be great served over ice as well. On Tuesdays I like to share what my fellow Volunteer Field Editors are making. This week AJ tried White Chicken Chili, and I definitely added that one to my must make list! Do you have an amazing recipe you'd like to submit to Taste of Home? Follow this link and learn how! Want to apply to be a Volunteer Field Editor? Check out the requirements and apply here! I'm Italian, so this month's Improv Cooking Challenge should have been a no-brainer for me. The first required ingredient was Italian Seasoning, which I buy in bulk because I go through it so fast. The second, wine, was a little trickier. I don't drink it, but I do keep a bottle of red and a bottle of white on hand for when recipes require it. One of my 2019 cooking resolutions has been trying to reduce my freezer and pantry stashes, and I'd accumulated a stockpile of turkey sausage links. A quick recipe search turned up several recipes, but this sausage marinara from Teresa K. also would help to clear out a box of pasta plus a few cans of tomatoes as well. This is going to be a hectic week, with a storm on the way and lots of errands to run. I love to treat my guys to something special for Valentine's day, but I know that I'm just not going to be able to fit baking something complicated into my schedule. I searched the Taste of Home site for ideas that I could make ahead, and the title of this one completely got my attention: Quick & Easy Chocolate Sauce. I always have a stockpile of baking chips in the cabinet, and had some heavy cream left over from another recipe, so I was good to go. Three ingredients, one pan, and in no time at all you have a lovely, delicious sauce that's great for pouring over ice cream, drizzling on frozen bananas. It would be great with angel food cake and strawberries. It's also great by the spoonful, straight from the fridge ;) Thanks so much to Mike M. for sharing his recipe! I've watched every season of the Great British Bake Off that I can get my hands on, I just love it. When the opportunity came up to try British inspired dishes with the Baking Bloggers, I spent hours looking through recipes. There was so much to choose from! As always, I have to take into account my families allergies and general pickiness, so I settled on scones. But even narrowing it down to that led me to so many amazing variations. I decided to look through my cabinets and let the ingredients I had dictate the flavors. Since I am overrun with baking chips at the moment, that made these Chocolate Chip Scones from Taste of Home the perfect choice. These were so quick and simple to make! You definitely could use any flavor chips you like, or even dried fruit. I'd have loved some chopped dried cherries mixed in along with the chips, but my my guys wouldn't have. Next time I'll make a batch just for myself that way. February is National Potato Lovers Month, and in this house, we are truly smitten. Red, purple, white, gold, mashed, baked, fried, serve them up, we're in! Because it's one of our most often eaten sides, I'm always looking for new ways to make them. I found these Sausage Stuffed Red Potatoes on the Taste of Home site and used it as jumping off point. I used hot Italian turkey sausage, and I also added about half a small jalapeno that I diced up along with the red bell pepper. The directions call for added the cheese in with the sausage mixture, but I just sprinkled it on top and then heated it up. These will be perfect for parties, or for game day. Since I dialed the heat up with the sausage and jalapeno, I enjoyed them with a little dollop of sour cream on top. So many different ways you could spin these by changing up the protein and the vegetables too.